Milo is a beautie. I know times are tough, but Milo's owners moved out of their house, and left poor Milo staked in the back yard. It's not known how long he was there without food and water before someone found him, but after all that, he's such a loveable dog. There's not much we know about little Sadie, other than she is absolutely adorable, and that someone dropped her off at a NC kill shelter. As told by Kelly, who fostered sweet little Cookie... I was an assistant Girl Scout troop leader for a troop of wonderful girls. At the last Girl Scout meeting of the year, a stray dog wandered up to the school where we hold our meetings. She stayed there, wagging her tail, for an hour while we held the meeting. The girls gave her water, but she was far more interested in pets and attention. She was emaciated and had scars all over her face and ears. She took to the girls immediately, and they named her "Cookie". At the end of the meeting, I took her home because the Humane Society was closed for the night. I gave her a bath and fed her. She was so grateful for the food, but she still stopped eating each time I would pet her because, even as hungry as she was, she valued the attention more than the food. The next day, the Humane Society told me they were full and could not take her. I couldn't find any other rescues that would take her, either, and the girls and I refused to let her go to Animal Control where we knew she wouldn't live for long. I had Cookie checked out by a friend who has a small breed rescue. 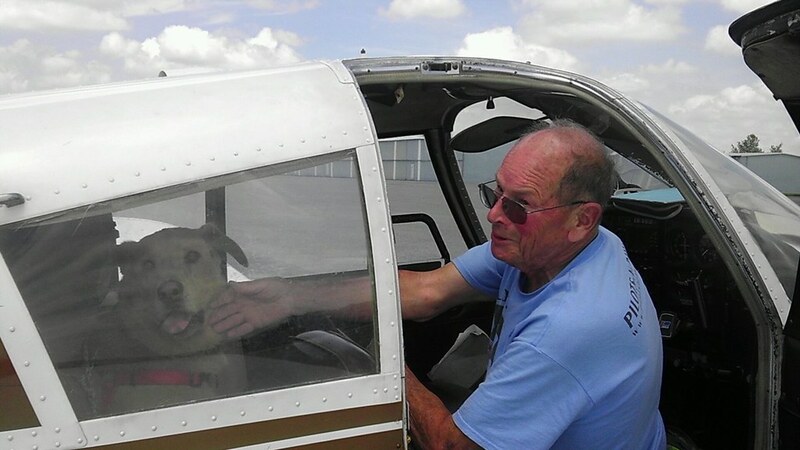 She said that Cookie was most likely a hunting dog that was "cut loose" when she got older and didn't hunt as well. This broke my heart because she is the sweetest, most loving dog I've ever met. My friend also determined that Cookie was positive for heartworm. All Cookie wants is love and affection. I'm so grateful to Helping Hounds for giving Cookie the chance to live out the rest of her days as a beloved pet instead of as a hunting tool. She is the most gentle soul I've ever known. 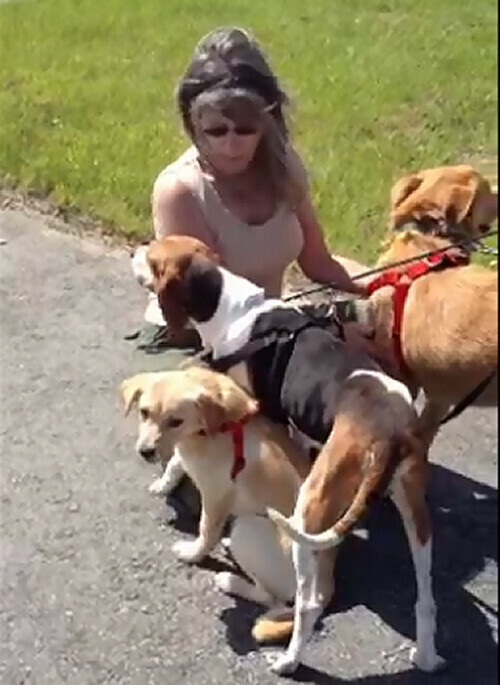 Team Mutt Muffs Michele meets the three amigos at Roanoke Rapids, NC. Little Sadie is just a puppy. Cookie, the Beagle, was just skin and bones. Big boy Milo is so well-mannered and just a joy. I know all three will find loving homes in Syracuse. We had a beautiful flight back to MD, right up the Chesapeake Bay. 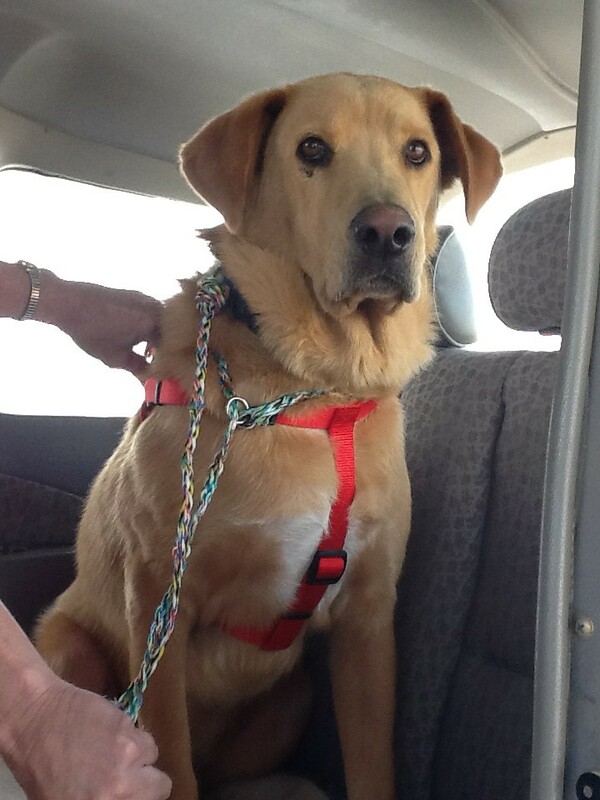 Milo looked out the window for most of the flight. 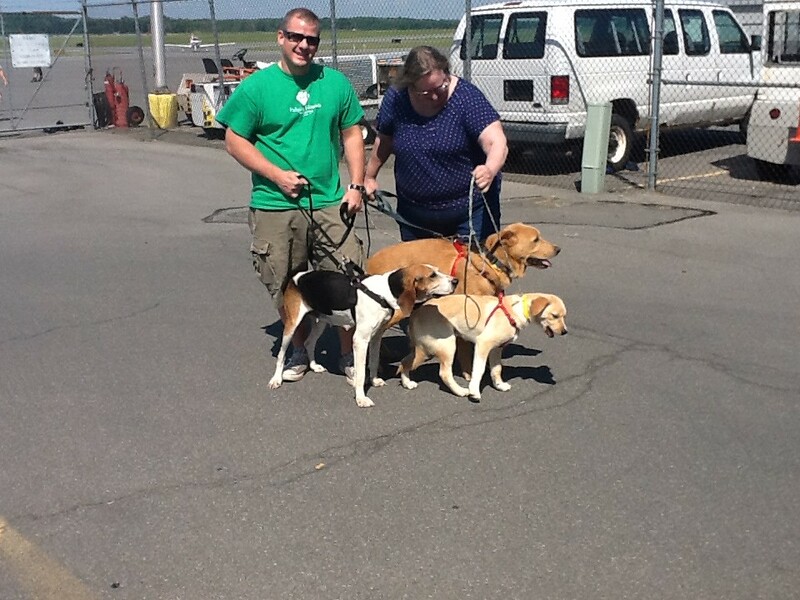 Here the dogs get to relax and take care of business before their next and final flight to Syracuse. Little Sadie, the puppy, didn't like the fuel truck one bit. 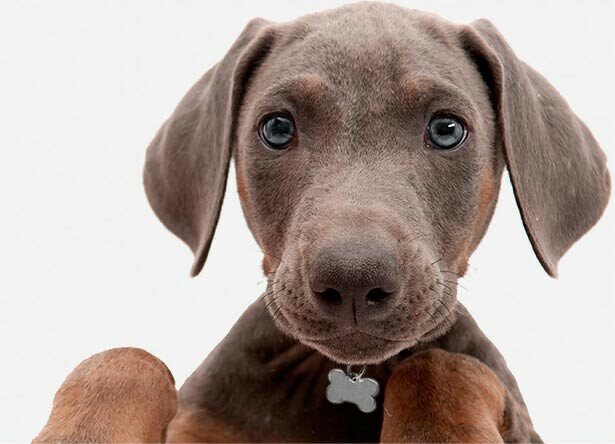 It was funny to see so much bluster come out of such a little puppy. Leg 2 Pilot Elliott gets the gang all loaded up for one more flight. 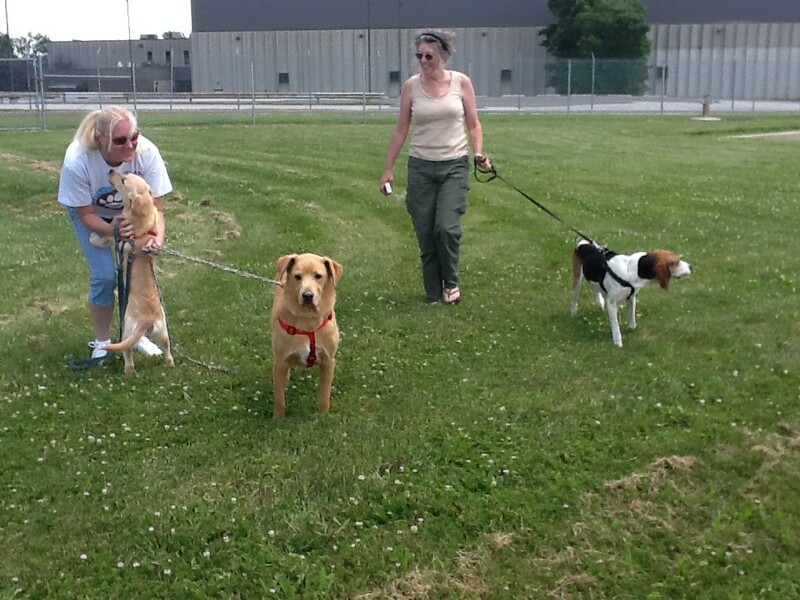 These great dogs are finally with the wonderful volunteers from Helping Hounds in Syracuse. Three more deserving lives were saved today. Too many more still waiting. God bless all the rescue volunteers.